In addition to using different types of code, the three frameworks have somewhat different features. See the Feature Comparison table for more details. Baked into the WASK template is the code needed to provide the large-screen experience consumers expect, as well everything needed to pass Amazon Appstore testing during the app submission process. At the bare minimum, you only need to provide a feed of media files, which the app will use to display a selectable list of categories and a rotating carousel of media content. While customizing or extending the basic WASK template, you can test your app using the Amazon Web App Tester. This is a Amazon Fire TV app used to test web apps on an actual device. The Web App Tester uses the same native app wrapper and web engine that will be used when the app is published, giving you an accurate preview of your app during development. When your app is ready, you can use the Amazon Developer Portal to submit your app to the Amazon Appstore and have it published within minutes, with no native coding needed. After signing up online, filling in the basic app details, and uploading thumbnail and preview images, you have a choice about where to host your app. You can either host the app's asset files on your own web server and submit just the URL, or you can upload the assets to Amazon's servers, where it will be bundled into a standalone packaged app. After you have submitted your app, it will go through an Amazon ingestion service, and you will be notified when your app is published. To learn more, see The Web App Starter Kit for Fire TV. 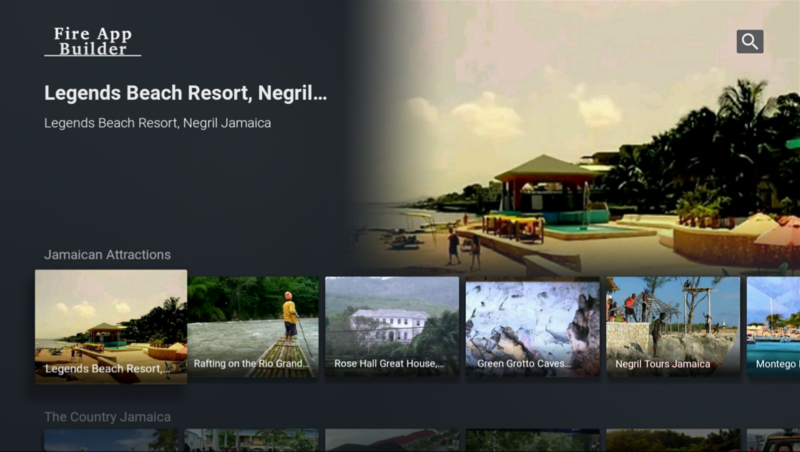 Some examples of Fire TV apps built using WASK include Acorn TV, Urban Movie Channel, and Euronews. Fire App Builder, available on Github here, provides a Java-based framework that you can use to easily and quickly build streaming media Android apps for Amazon Fire TV. In contrast to the HTML5/CSS3/JS used with WASK, Fire App Builder uses Java Android code. With Fire App Builder, you work in Android Studio, connect to your Amazon Fire TV device through Android Debug Bridge (adb), and generate an APK (Android Package Kit) file to upload to the Amazon Appstore. Although Fire App Builder uses Android APIs (particularly the Leanback Library), you do much of the configuration and customization through JSON and XML files. For example, through JSON and XML files, you can configure more than a dozen components to add to your app. Components provide out-of-the-box functionality for analytics, ads, authorization, purchasing, and media players. With Fire App Builder, your media feed can be JSON or XML, in any structure using any tag names. When you configure Fire App Builder, you’ll write query syntax (using JSON Jayway syntax or XPath expressions) to target the various elements of your feed. Your feed can also require tokens for media protected by DRM. Support for YouTube-based feeds and other video hosting services is on the roadmap but not currently included. You have a lot of control to adjust the colors, layout, typography, and more — all by editing XML or JSON files where these settings have been extracted. A more compressed homepage layout is also available. To learn more, see the Fire App Builder documentation. For a sample app built with Fire App Builder, see the Hallmark app. 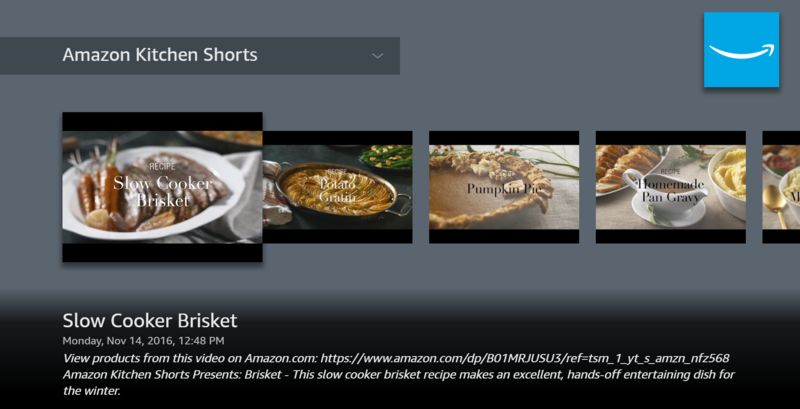 Amazon Creator provides a simple, browser-based interface where you can build an HTML5 web app for Amazon Fire TV by providing either your YouTube channel or your Media RSS (MRSS) feed as the data source. 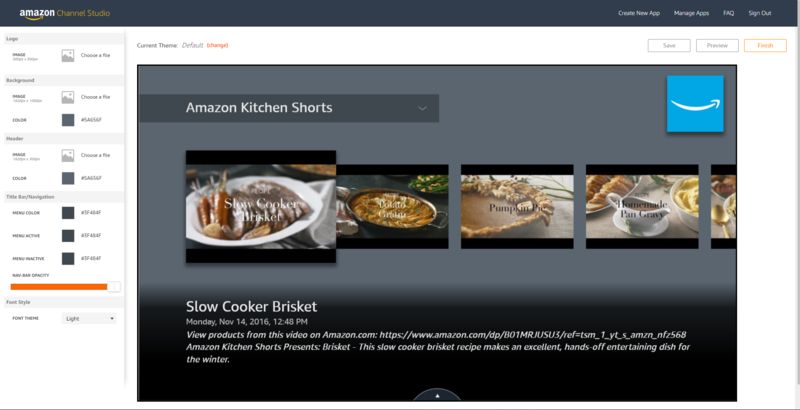 If you already have video content either on YouTube or a web server, you can quickly create and publish an app (in a matter of minutes) using Amazon Creator. Amazon Creator doesn't require any programming skills — it's intended for content creators rather than developers. Amazon Creator apps look similar to WASK apps. This is because Amazon Creator uses WASK behind the scenes to build the web app. After you configure your feed, you can style the appearance of your app using the sidebar's visual editor to select colors, fonts, or background images you want. When you're finished, you can publish your web app into the Amazon Appstore directly from Amazon Creator. You can likewise make updates to your live app directly from Amazon Creator. Your app dynamically pulls in content from your YouTube channel or feed, so any updates to your content on YouTube or your feed will automatically appear in your live app. Apps you create are available in all regions where Fire TV is available — United States, United Kingdom, Japan, Germany, Austria, and India. You can also localize your app for Japan and German regions. To learn more, see the Amazon Creator documentation. The following table compares the features available across the three platforms. Note: If Fire App Builder or WASK doesn’t have a feature, it doesn’t mean the framework won’t support it. It just means the feature isn’t already integrated in the code. Usually you can insert the third-party code needed into Fire App Builder or WASK to support these services. Global Catalog Search Integration into the Amazon Catalog for global voice search. See Cordova plugin for Amazon Catalog Integration for more details. Again, you can add the services and features you want into either framework. The code is open (and open source), and you're free to enhance, extend, or otherwise build on top of the framework's code. Some companies prefer to start out with a web app (such as WASK or Amazon Creator) and later transition to a Java Android app (such as with Fire App Builder). Note that when you submit an app to the Appstore, you select the app type (whether web app or Android app). After you submit an app, you can't transition from one app type to another (not yet anyway — app-type conversion is on the roadmap). If you start out with a web app and want to upload a new version that is a native Android app, you can't do this. You will need to upload a separate app entirely, which means losing any existing users and metrics. If you're planning to make the transition from a WASK to a native app (such as Fire App Builder), consider using Cordova with your web app. Cordova allows you to wrap your web app as an APK and submit the web app as an Android app. If you later decide to switch to a native app, you can publish a new version of your app in the Appstore.